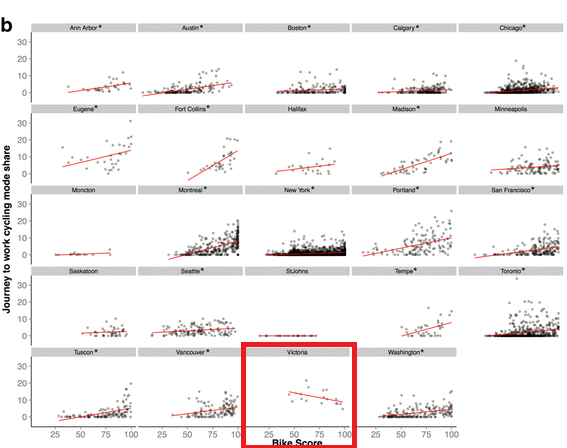 But when you compare the two using the O&D geography, comparing north to south shows the same pattern: north is higher in the CRD O&D while that is reversed in the NHS data. What about comparing when the surveys were conducted? NHS asked about the week of May 1-7, 2011, while the Origin & Destination ran in the fall of 2011. But the weather impact should have hit both surveys equally, so that can’t explain it. Margin of error might explain it. 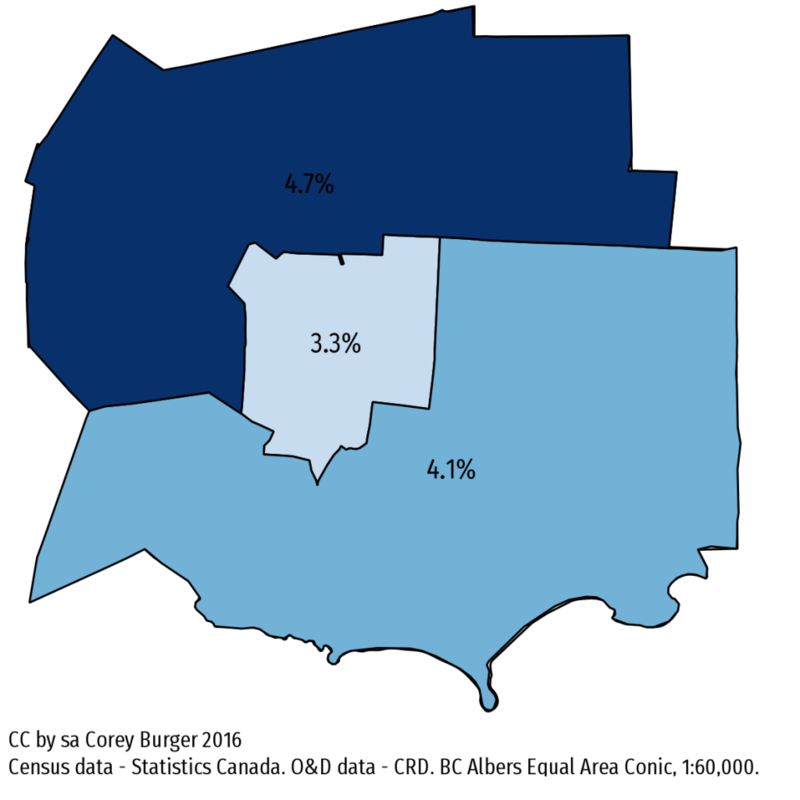 The CRD O&D at this level has a margin of error with between 2.8% and 9.5% (so larger than any differences). NHS doesn’t report margin of error, but it had a non-response rate of around 25%. Which is to say: take all these numbers with a grain of salt. So maybe all of this can be chalked up to bad numbers. I have long suspected that Bike Score relatively simplistic breakdown of “bikeability” is a bit too simple. This isn’t really the fault of the Bike Score people, it really is a data problem. 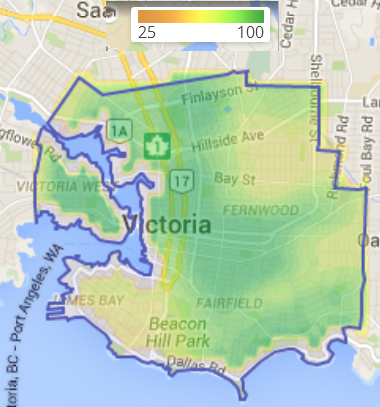 Good data about whether a street is “bikeable” simply isn’t available. What is available is infrastructure and topography. 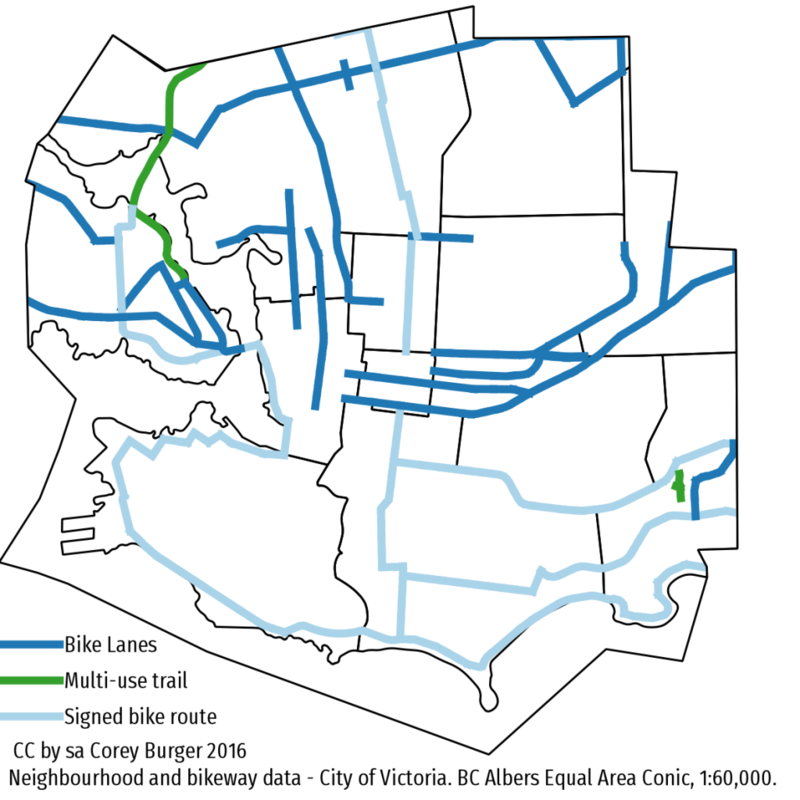 In our case, most of the bike infrastructure that Bike Score tracks goes east or north/west – bike lanes on Douglas/Blanshard/Government or Fort/Yates/Pandora/Johnson and the two regional trails which run north/west. Still, Bike Score is a valuable first-cut of a tool to help figure out what is happening. 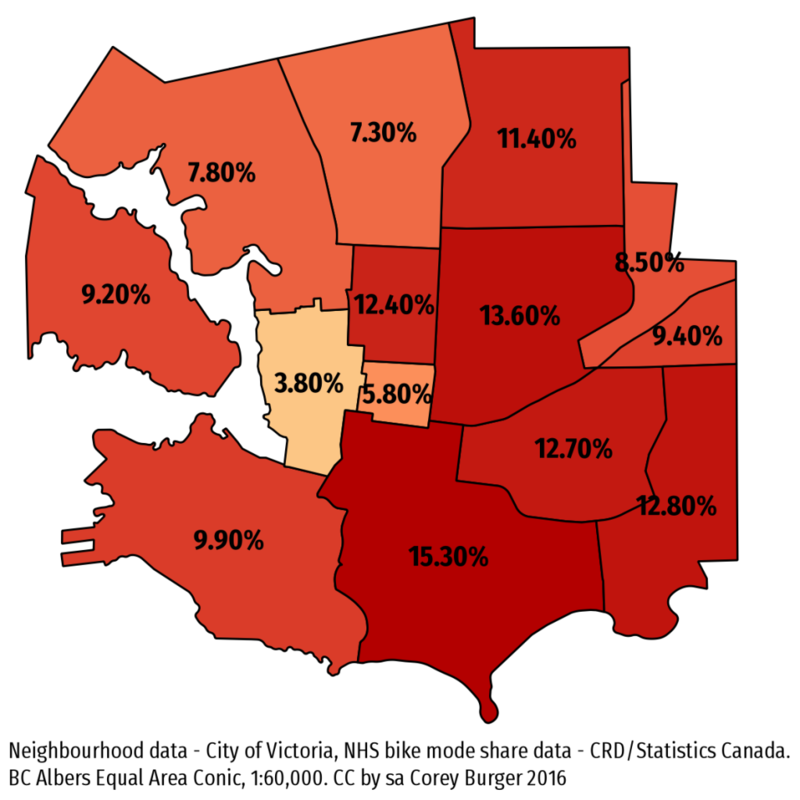 That Victoria doesn’t fit the pattern isn’t surprising, we are the anomaly when it comes to mode share – being several percentage points ahead of the next highest city in Canada. To better capture where people bike, I would love to see Bike Score innovate and do something similar to the CRD comfort index and use that instead of pure infrastructure, but given the massive data challenges, I am not holding my breath. 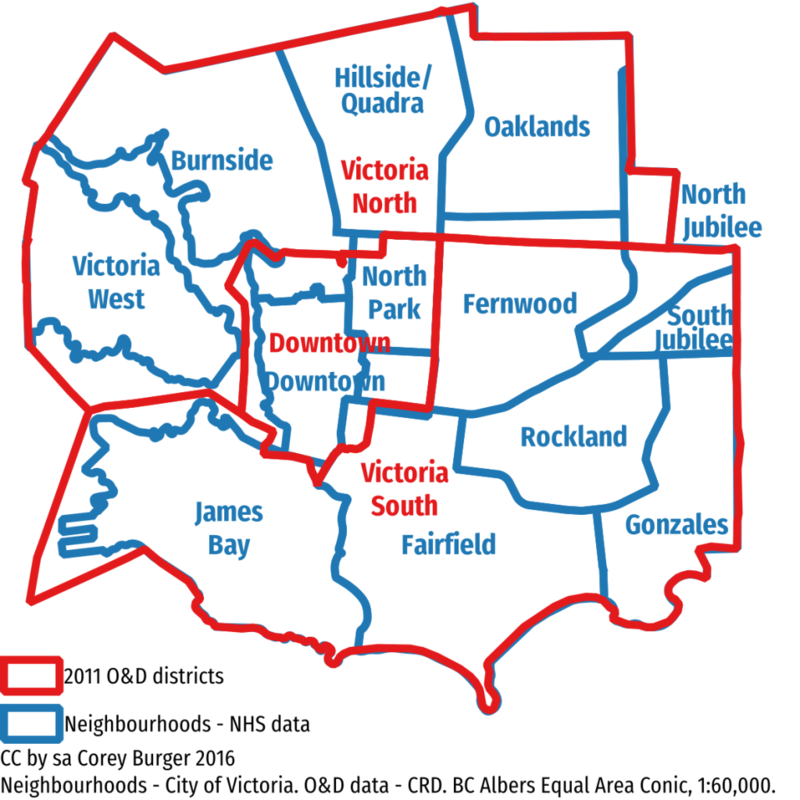 Posted on March 16, 2016 March 16, 2016 Categories BikingTags Bike Score, SFU1 Comment on Bike mode share vs Bike Score: Why is Victoria so weird? Day one of a conference is usually the time for the big speakers to come and tell us about their grand ideas and successes and Gaining Ground is no different. As Mark Holland remarked in his opening comments, this is a fairly unique conference in that we don’t “disappear into a big building and come out when the sun has gone down”, rather we are spread across four venues and our lunches are out in the wider community, as places such as Steamworks or Wild Rice. It is a nice refreshing change, because SFU’s brand new campus in the Woodwards building is very shiny and new and it is easy to forget we are on the borders of the Downtown Eastside. The host mayor, Gregor Robertson, led the day off, talking about the various accomplishments the city has seen through since the last Gaining Ground in 2009, including changes to the building code, a massively successful transportation plan for the Olympics, new electric car charging stations (they are planning for 15% of the fleet by 2020), and various green jobs initiatives, including one in the Strathcona neighbourhood. At that he had to run off to council, where they are deciding the fate of the proposed Hornby St. separated bike lane. Easily the most dynamic speaker of the morning was Jared Blumenfeld, now of the US EPA, late of the San Francisco Dept. of the Environment. He had the whole audience laughing, talking about how we got to here (The Inconvenient Truth, the hockey stick graph, peak oil, BP spill, etc.). He had a few pithy comments, calling all the greenwashing “greeningless” and of the climategate scandal, where there’s a t-shirt, there is a problem. One of his key points was the drivers of change need to be cities. While India and the US may disagree on climate change and how to tackle it, the mayors of New York and Mumbai have some pretty similar interests. One example he mentioned was the banning of phalates in the US, which went from a municipal ordinance in San Francisco, to California state law, to federal legislation, all in the space of 6 months. What was amazing is that both the city and state got sued because they didn’t have the right to ban it, but did it anyway. The presidents of SFU and BCIT were up next, talking about the many things that both institutions can do. What grabbed was the Translink RFP out for a gondola (ala the Portland Aerial Tram) up Burnaby Mountain and Don Wright of BCIT pointing out that sustainability includes housing costs, and if those aren’t brought under control, all the others gains will be for nought as the young move away or become car commuters and change their views. So far, so good. This afternoon is filled with various workshops and salons, which should be interesting.